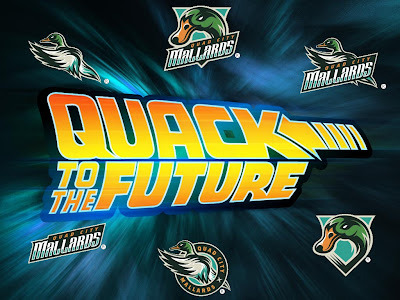 Ronn's Minor League Hockey Mania: The Quad City Mallards are Returning! This afternoon while surfing some of my favorite hockey sites, I found this logo and story on the front page of the IHL web site. Great news for me as I was always a big fan of the Quad City Mallards, and very disappointed when the AHL Flames displaced the Mallards. But, now that the Flames are moving here to Canada, the Mallards are returning to Quad City! ROCHESTER, MI--- The International Hockey League (IHL) announced Tuesday that the IHL Board of Governors unanimously approved the second expansion franchise in the IHL to the Quad City Mallards. The team will be owned and operated by QCHT, LLC with managing partner Christopher Lencheski. The Mallards will start play for the 2009-2010 season at the i wireless Center, located in Moline, Illinois. “Chris’ ownership group is a perfect fit, not only for Quad Cities, but for the International Hockey League,” stated Michael Franke, IHL Chairman of the Board. “Quad Cities has a rich tradition of hockey that will be re-established in the IHL, as fans will have the opportunity to get close to their players once again. The relationship between the fans and the players is an important factor to all IHL owners, along with our geographic proximity to one another.” Mr. Lencheski is Founder, President, and Chief Executive Officer of SKI & Company, a marketing communications company servicing the motorsports and high performance automotive industry with offices in New York City, New York, London, United Kingdom, Dubai, United Arab Emirates, and Bethlehem, Pennsylvania. He is also the owner of SKI Motorsports, a NASCAR racing organization. “We are thrilled to bring professional hockey back to the Quad Cities and to the i wireless Center,” said Lencheski. “I have always been passionate about sports, and hockey is my first love. With that said, I can tell you that we analyzed numerous prospective cities in an exhaustive search over the last several months for a city that truly wanted a hockey team and one deeply rooted with hockey history. The Quad Cities community demonstrated enormous support and enthusiasm for the return of pro hockey.” The IHL will conduct the scheduling meeting for the 2009-10 season Wednesday, July 1st in Fort Wayne, Indiana. The league will hold the dispersal draft of the Kalamazoo Wings players’ rights on Thursday, July 2nd via conference call. The expansion draft for the Dayton Gems and the Quad City Mallards will be held immediately after the dispersal draft. For inquiries regarding the Quad City Mallards, please contact Amy Stump, IHL Director of Media Relations at 269-492-3432.